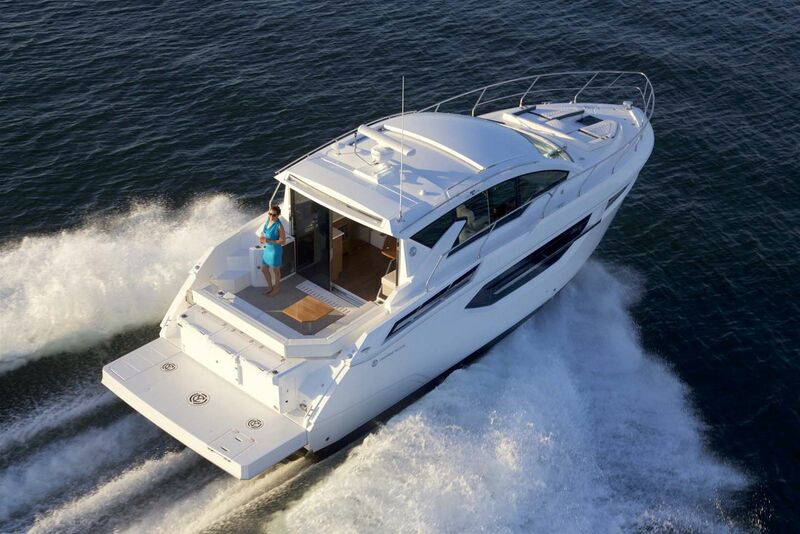 The new Cruisers Yachts 42 Cantius may be the smallest of the popular Cantius model line, but it sure doesn't feel that way when you step on board. 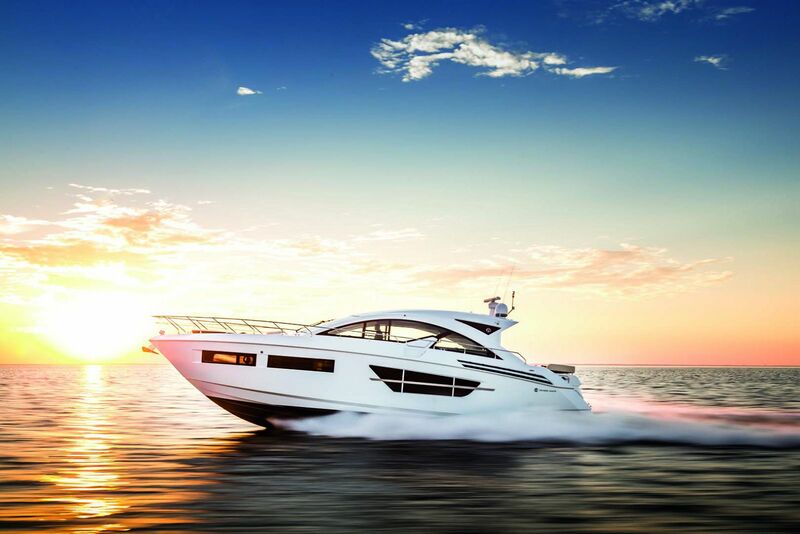 Having already built the 45, 48, 50, 54, and 60 Cantius models, the new 42 was simply meant to be a smaller version of its larger siblings. 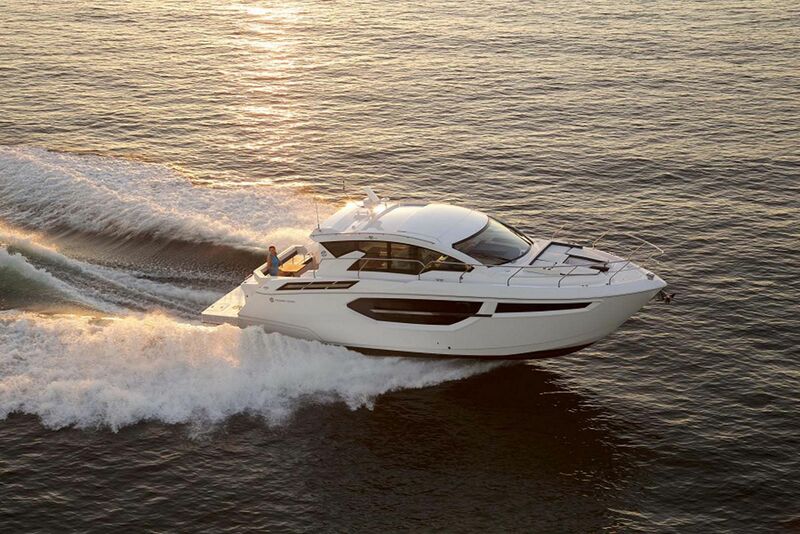 If you are looking for a luxury sport yacht for cruising and entertaining, look no further than the 42 Cantius. 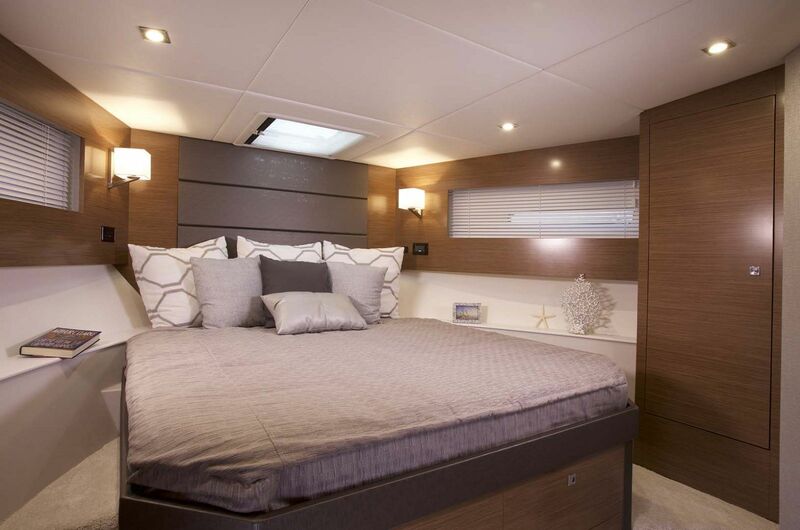 A noticeable advantage of the new model is that the cockpit, salon, and helm are on the same level and separated by a large sliding stainless steel frame door that when opened completely, creates a seamless space on board. “Each new model is designed around a full-size mock-up assembled in the plant. 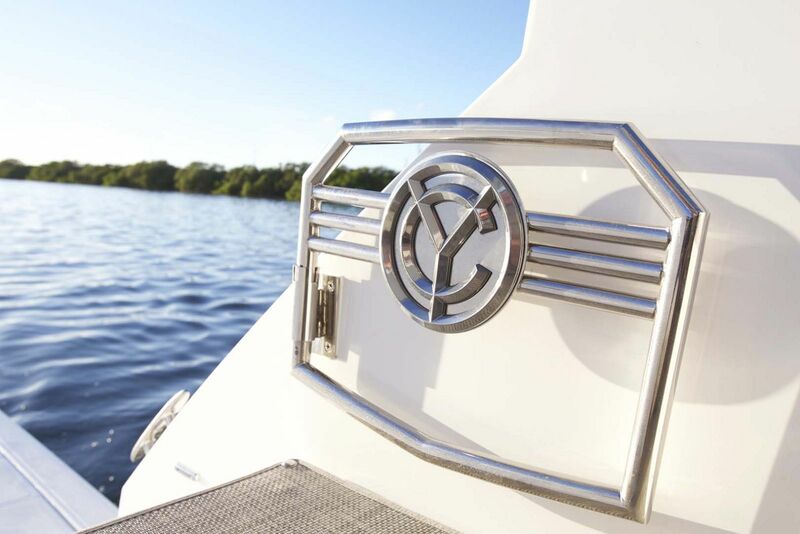 The process shows us how all of the boat’s features and accommodations will function in real-life conditions, underway and at the dock,” says Matt VanGrunsven, Cruisers’ marketing director. 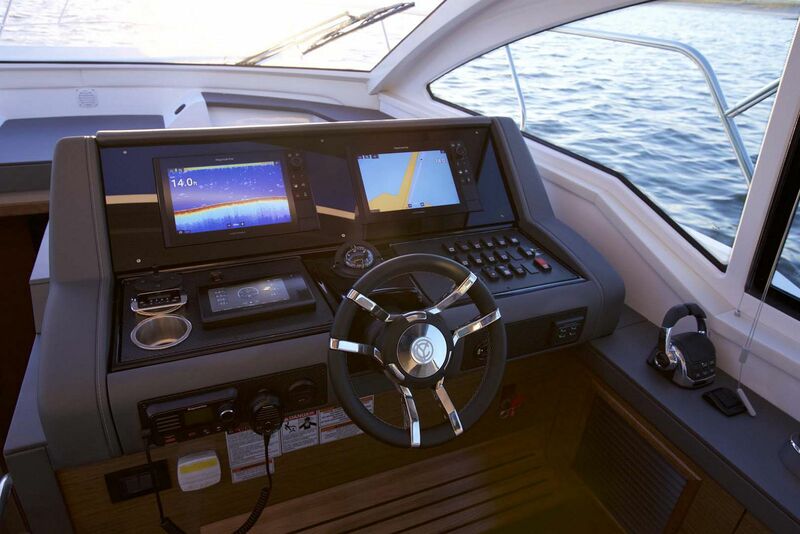 Whatever the design process that the Cruisers team goes through, it seems to be working quite well when it comes to the functionality and styling of the Cantius line. 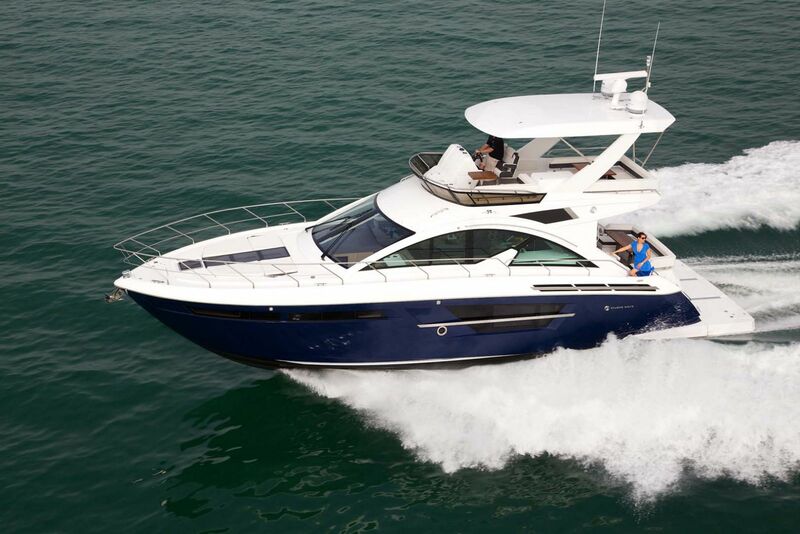 The aft cockpit of the Cruisers 45 Cantius features comfortable, wrap-around, seating, a starboard-side ice chest, two removable cockpit tables, and so much more. The Amtico flooring adds a final touch of refined style. 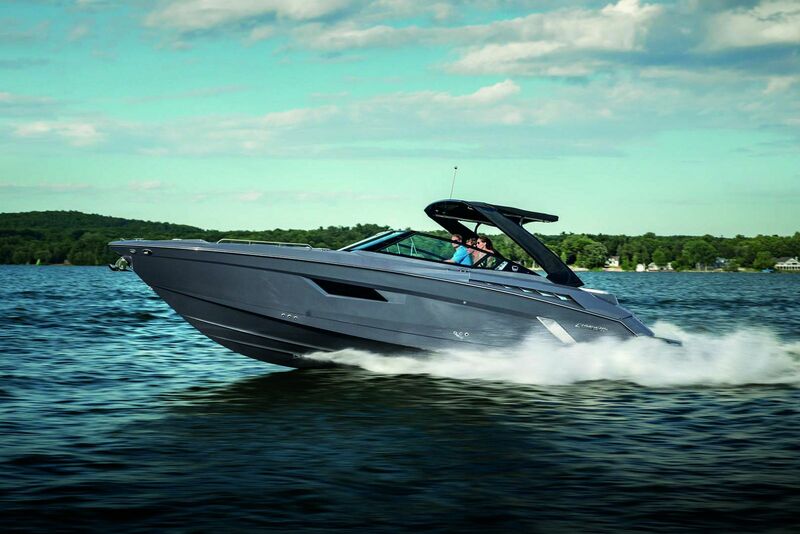 Customize your Cantius with a grill, refrigerator, and stools to enhance your boating experience. 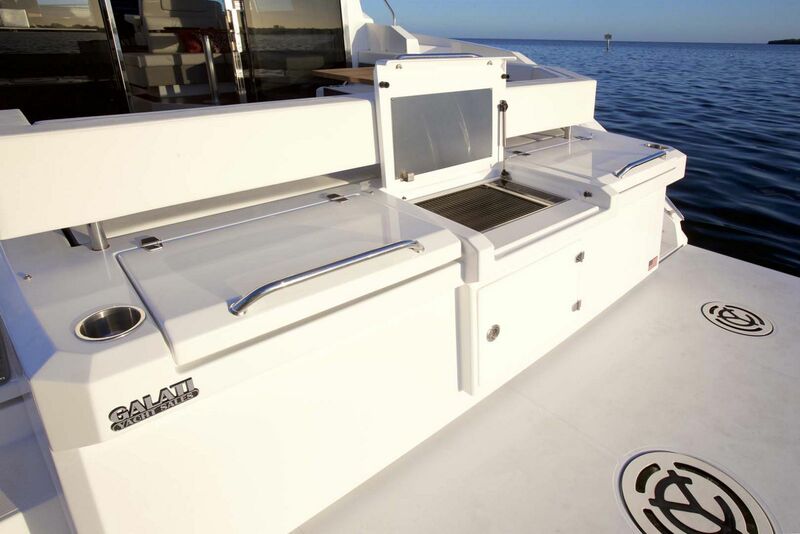 This also provides a great space for laying out water toys like boarding a paddleboard or even putting on scuba or snorkeling gear. 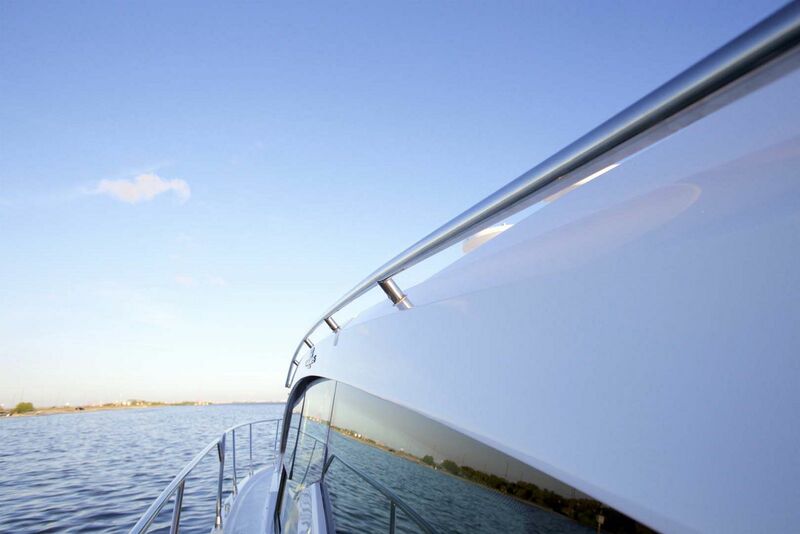 Following a trend that we’re seeing more, Cruisers Yachts put some extra effort into the design and execution of the foredeck. There’s a U-shaped sun pad with cushions that lay flat for group seating and sun bathing. The backrests can be raised to create dual forward-facing lounges. 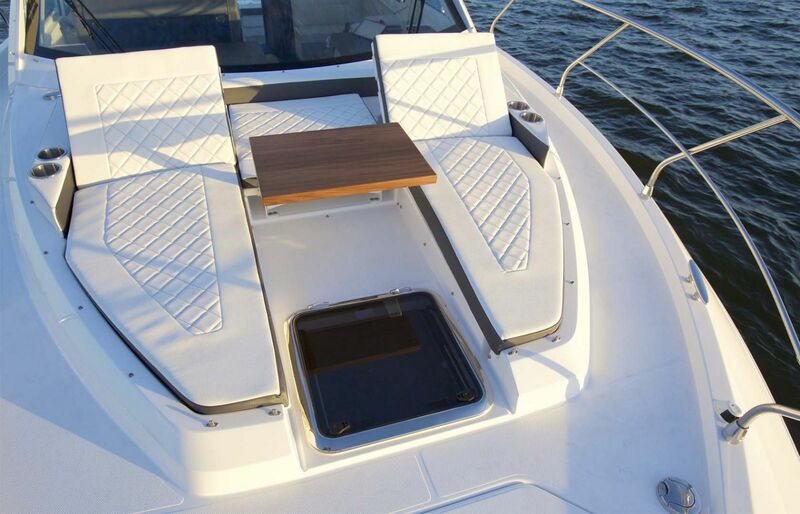 A centerline table folds up on custom hinges to enhance the area’s versatility, as does an optional sun shade. 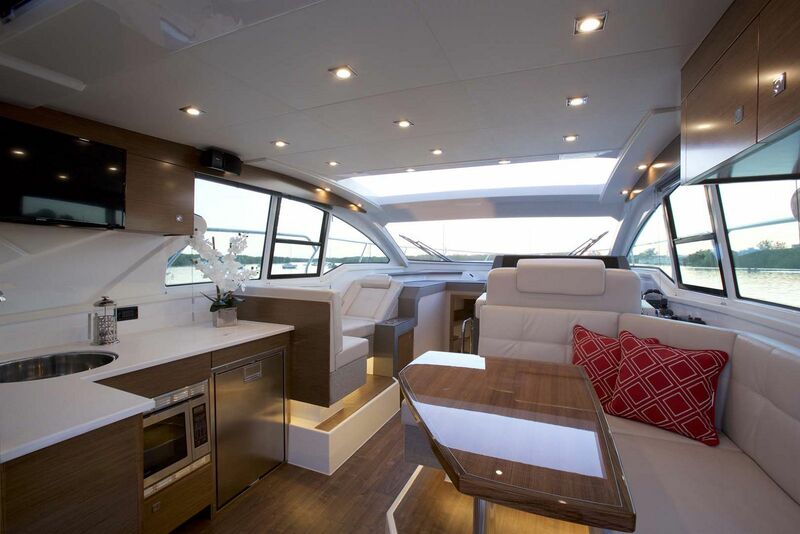 While the aft cockpit can be a great place to lounge and enjoy a conversation, the bow of the 45 Cantius is simply a sunbathers paradise. 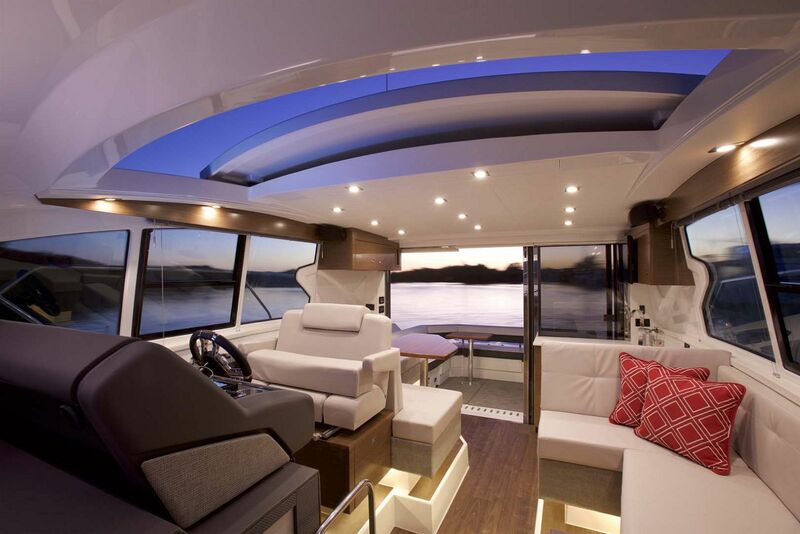 Moving through the stainless steel doors into the salon, you will immediately notice the large windows along both sides as well as the retractable sunroof, all of which lets in natural sun or moon light depending on when you're boating. 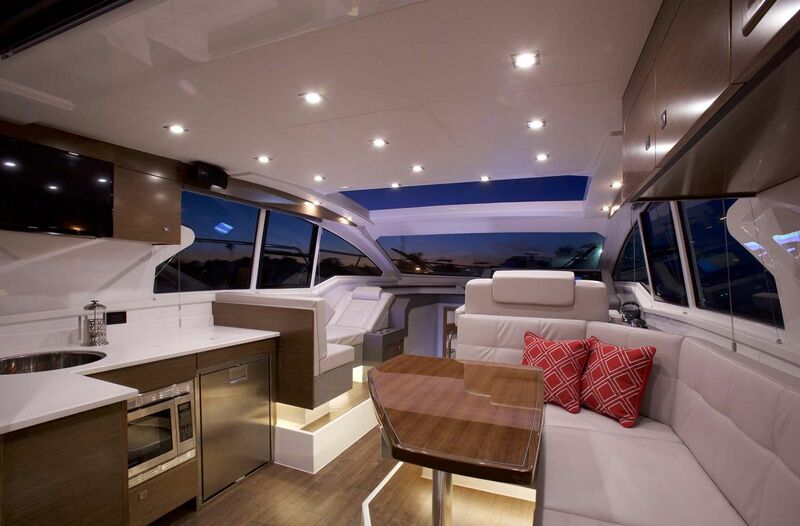 The open concept with everything being on the main deck allows everyone to be a part of the fun no matter if they're at the helm or at the dinette. 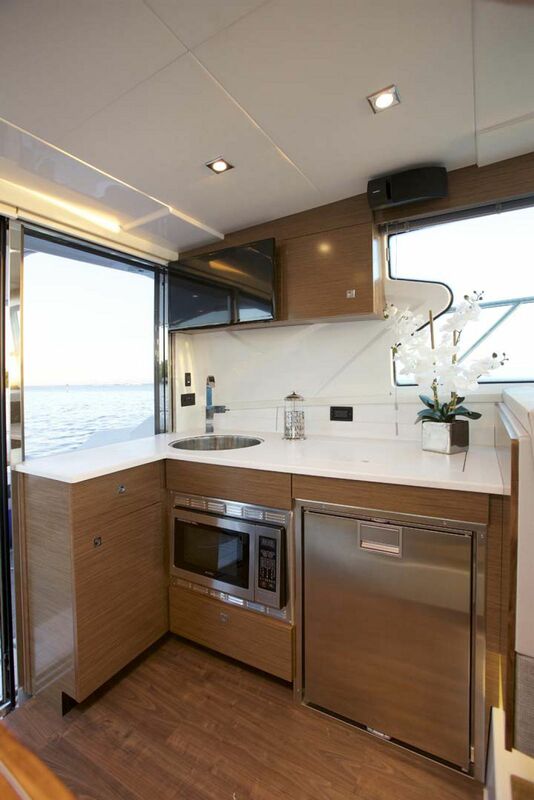 The galley comes well-equipped with lots of storage space, a microwave/convection oven, sink with spray faucet, 32" flat screen TV, and refrigerator/freezer. 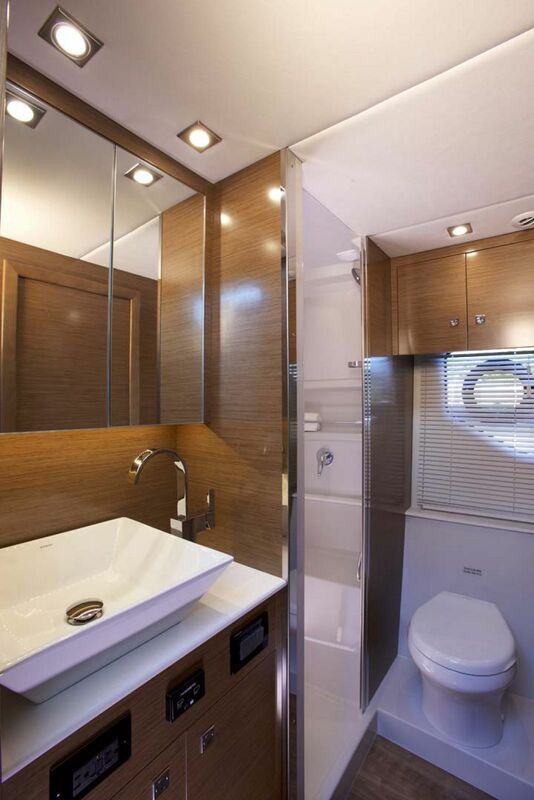 As with many express cruiser designs, the air-conditioned master stateroom is placed forward. 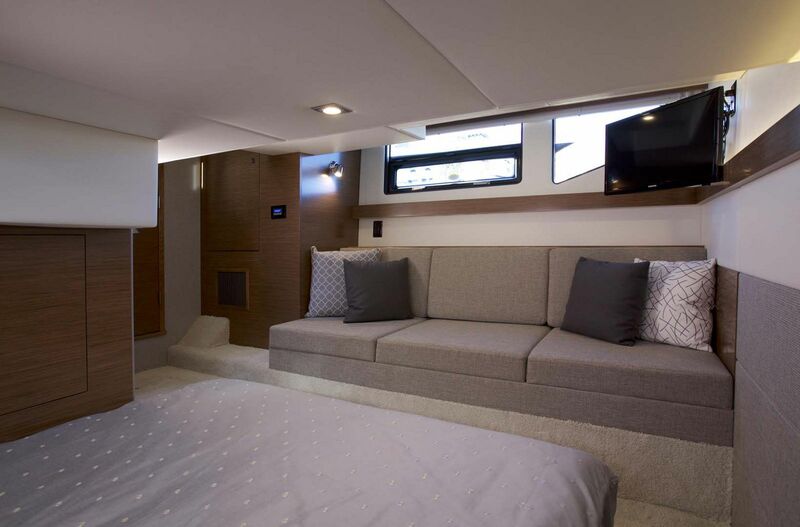 The 42 Cantius carries its wide beam to the bow and uses the volume for a centerline queen-size berth with a therapeutic foam mattress, which faces the 24-inch flat-screen television. Four drawers are in the base of the bed and two cedar-lined hanging lockers provide ample wardrobe stowage. 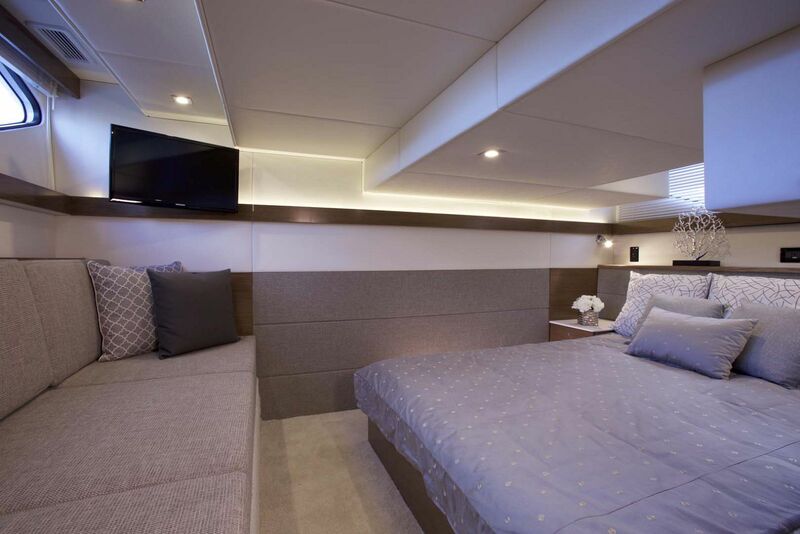 The VIP stateroom is almost equally as nice with a massive king-sized berth, a mounted flat screen television, large windows. 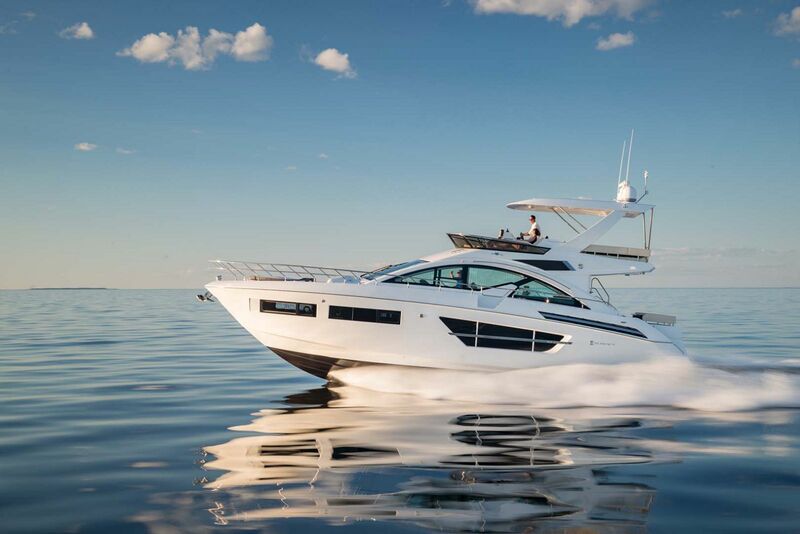 If you'd like to learn more about the new Cruisers Yachts 42 Cantius, please contact your SI Yachts Sales Professional today to get started. 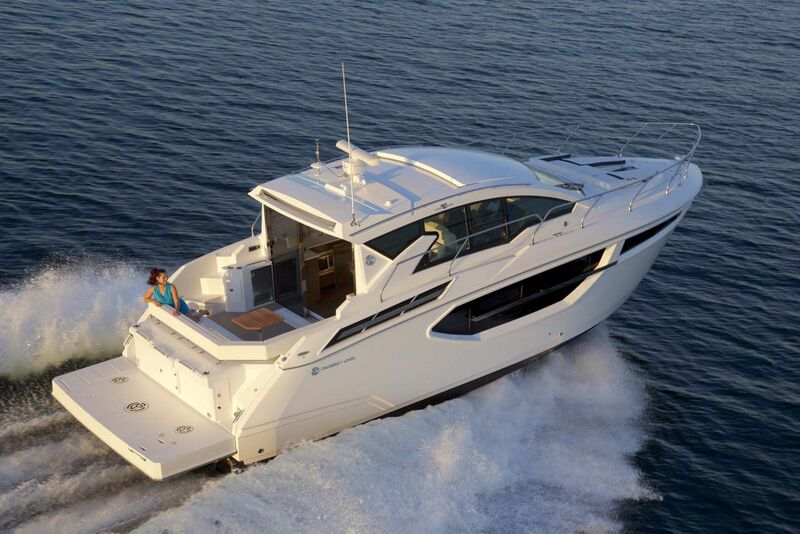 BoatTest.com takes the new Cruisers 42 Cantius for a spin. 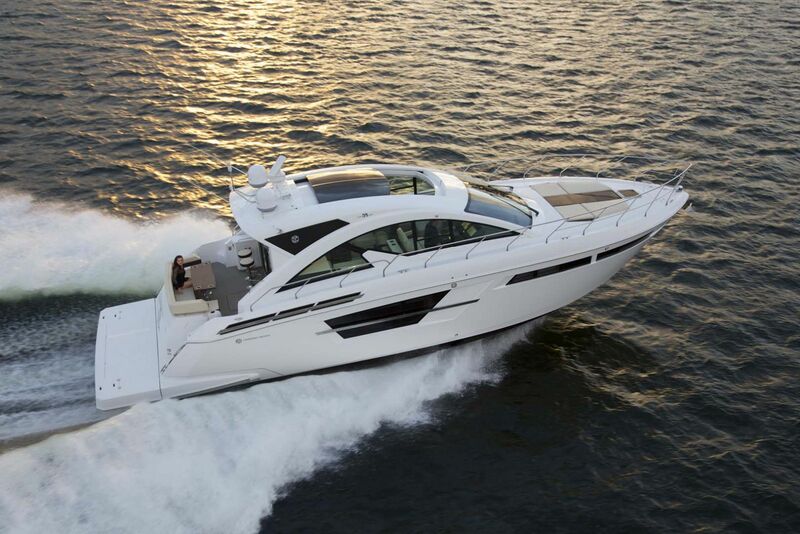 Cruisers Yachts released this official video of the new 42 Cantius.